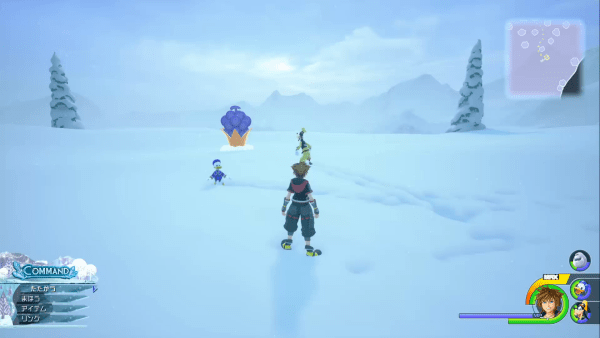 A guide on Kingdom Hearts 3's Flantastic Seven missions, including locations of each across the various worlds and guides to get a high score. 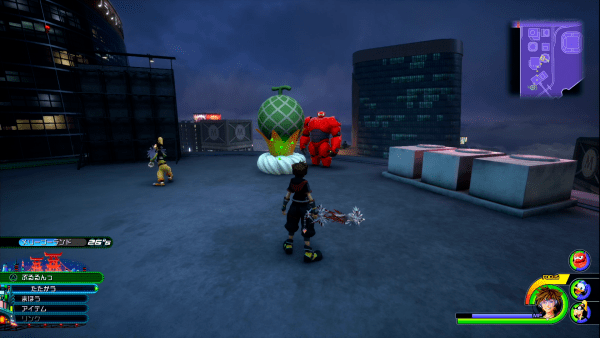 In the various worlds of Kingdom Hearts, there are special Flan Heartless that initiate mini-games when you approach them. Depending on your score, you will receive various items, abilities, and even special ingredients used in Cuisine. Once you’ve cleared and achieved high scores for all the Flantastic Seven missions, you will receive a rare synthesis material called Orichalcum. 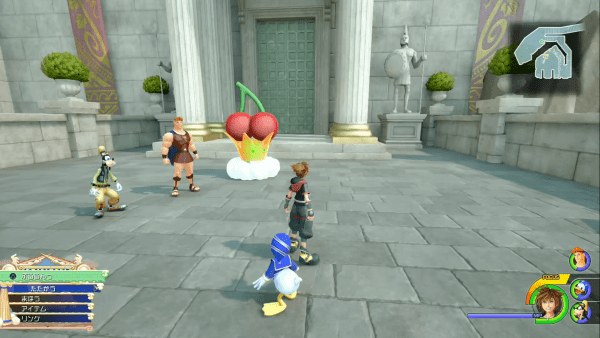 The Cherry Flan can be found in the hill temple of Thebes in Olympus. Approach the Cherry Flan to start the mini-game. Be careful of hitting walls or stumbling over obstacles which will slow you down. *High Score is about 20,000 points or more. 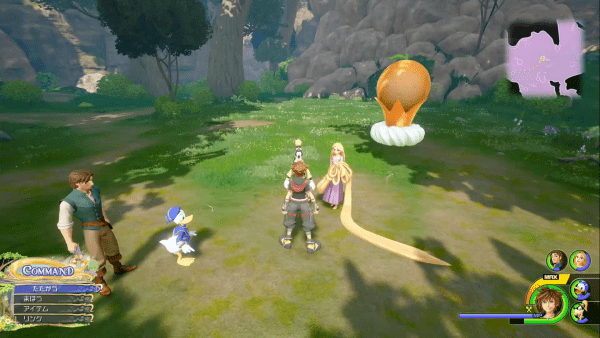 The Orange Flan mission appears near the hill at the center of the map in the Kingdom of Corona. Approach it to start the mini-game. The Orange Flan mission in the Kingdom of Corona requires you to take pictures of seven Flan Heartless in the area. 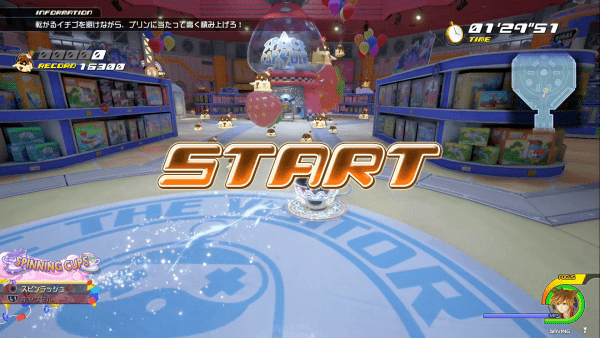 The rewards obtained in the mini-game depend on how many photographs the player has taken. Of course, being able to snap photos of all seven targets will net you a high score. *High Score is about 20,000 or more points. The Strawberry Flan mission can found near the beverage vending machine at Galaxy Toys in the Toy Box. 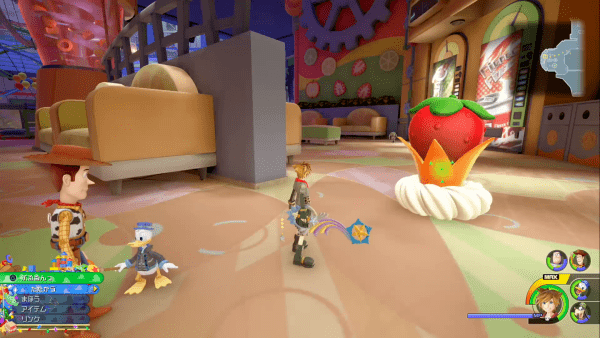 The Strawberry Flan mission in the Toy Box requires you to use the Mad Tea Cups Attraction Flow. You need to collect as much Flan Heartless as you can and balance them on top of you within the time limit. *High Score is about 17,000 or more points. 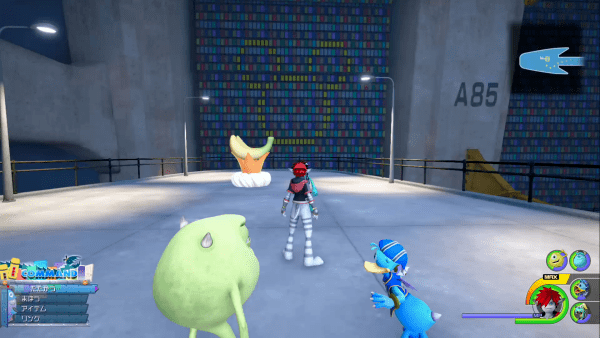 The Banana Flan mission can found in the Monstropolis factory basement level. It is in front of a huge Lucky Emblem in the area. 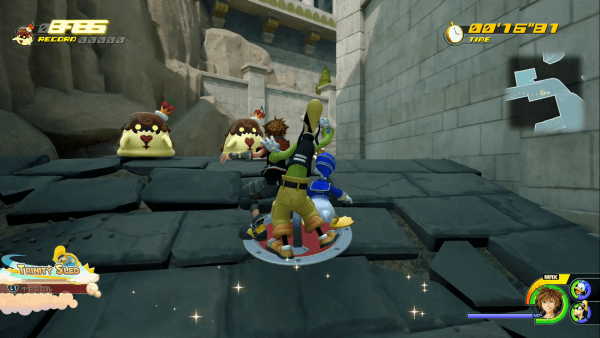 The Banana Flan mission in Monstropolis requires you to take down the small Flan Heartless while avoiding the giant Flan Heartless in the center within the time limit. 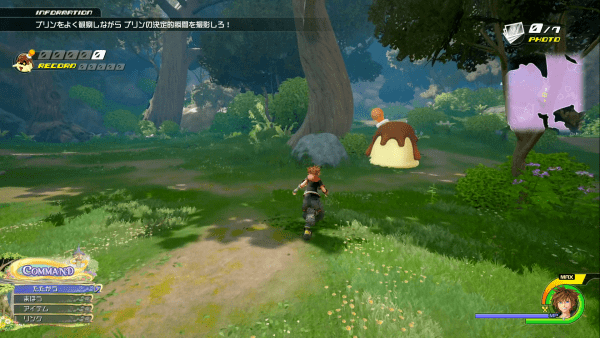 If you get caught by the large Heartless, the game will end immediately. The Grape Flan mission can found in Arendelle. 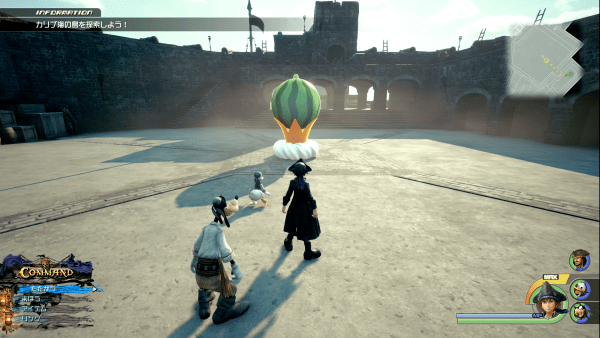 Jump off from the north mountain from the side of the Moogle Shop to reach the area. 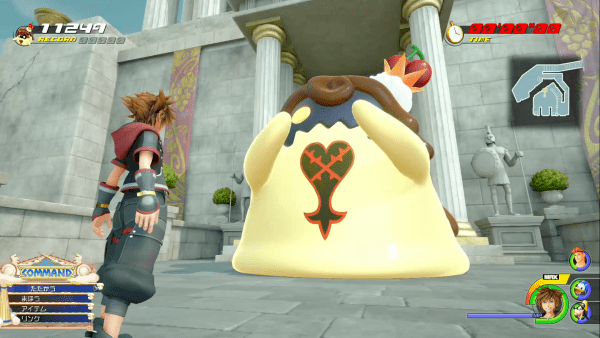 The Grape Flan mission in Arendelle requires you to defeat small Flan Heartless within the time limit. You can get close to the enemies by riding the lane where the Heartless fly. The Watermelon Flan mission can found in the fortress in The Caribbean. It will be in the area at the right of the fort. The Watermelon Flan mission in The Caribbean requires you to shoot down flying Flan Heartless with the cannons within the time limit. A large Flan Heartless will occasionally appear and will net you big points if you take it down. It is possible to barrage enemies with three cannons at once by ringing the bell in the middle. *High Score is about 28,000 or more points. The Melon Flan mission can found in San Fransokyo south of the central city atop a circular building at night. The Melon Flan mission in San Fransokyo requires you to jump on several Flan Heartless a number of times to make a glowing Flan Heartless appear. 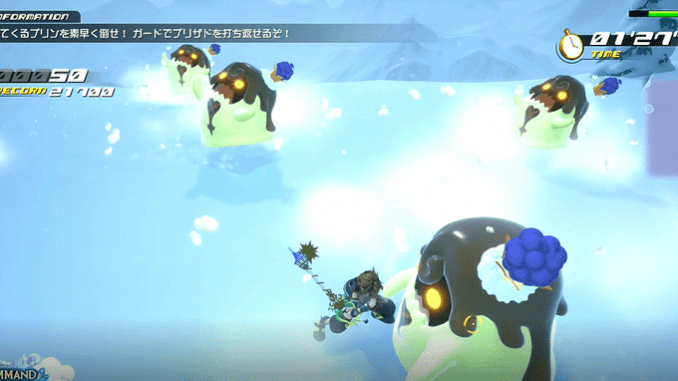 Jumping on this unique Heartless allows you to move to the next area. *High Score is about 15,000 or more points.